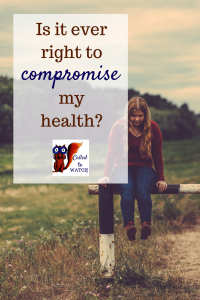 I have a chronic illness: Is God calling me to sacrifice my health? I have a chronic illness, and I’ve recently been challenged about what it looks like for me to serve, specifically in mission (whether domestic or overseas). Today’s post is my thoughts in regards to a series of questions I was asked by Wendy. Q1. Why does it seem noble to sacrifice personal comfort to serve God in a third world country, but not to sacrifice your energy (as someone who has chronic fatigue) to serve in my own country? Firstly, I think you’re right when you say there’s a difference between giving up your health security in a general sense (moving to a 3rd world country) and specifically sacrificing it, knowing exactly what the consequences will be. Both scenarios involve potential daily suffering, but they are different, and I think it’s very important to acknowledge that at the very beginning. Does that make one more noble than the other? Maybe/maybe not, it depends on motives and circumstances and a whole lot of variables. Remember it actually doesn’t matter which is nobler. Q2. Personal health seems like such an untouchable thing, because you “should be healthy”. Is it really a line we shouldn’t cross? Am I allowed to sacrifice myself for the sake of the gospel? Sacrifice is not an unusual thing. We all sacrifice every day – simply because we are finite creatures. If I get two party invites, I can’t go to both, so I must sacrifice one for the sake of the other. This sort of sacrifice is a ‘one off ‘. It’s immediate and the consequences are concrete – like when someone with chronic fatigue (such as yourself) chooses to invest in a short term domestic mission. But suppose I have promised a friend in advance that I would go to her party, and then I receive a second invite. It is at this moment that my promise becomes a sacrifice (giving up the second party for the sake of the first). Perhaps this is similar to a missionary choosing to live in a third world country – the sacrifices don’t become tangible until later. Is it really a sacrifice? In light of my friendship, is going to the first party actually a sacrifice at all? Perhaps there’s nothing noble about it. On the other hand, I may actually prefer to go to the second party and then yes, my choice is sacrificial. Our ‘sacrifices’ for the cause of Christ are never really ‘one offs’. We are only ever following up on the decision we made when we decided to follow God. I say all this not to be pedantic, but because it helps me to make decisions, to realise that no decision stands on its own – it is all simply ‘fallout’ from the big Decision I’ve already made. I think sacrifice has to do with self-care. Self-care is, after all, always a sacrifice. For those who suffer from chronic illnesses, it may be a very big one. 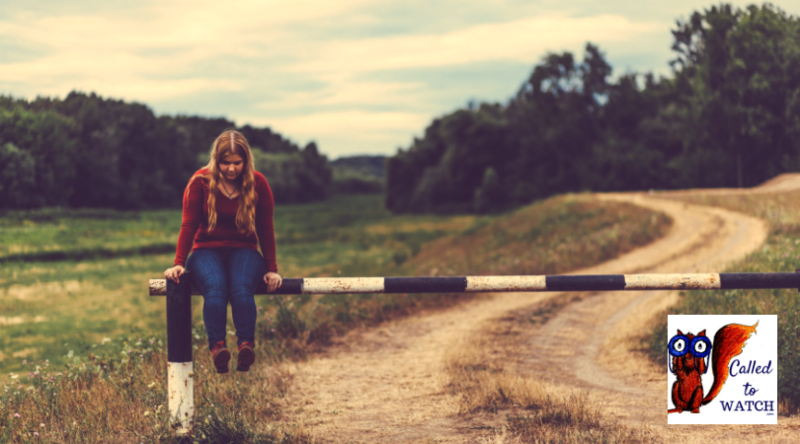 Should you choose self-care or recklessness? There are many reasons to be ‘reckless’ as you put it: it make us feel noble, it looks good, feels good, it’s in line with our personal desires, etc. Part of trusting in God is trusting Him for the future. Yes, we are called to live in light of eternity (and we often use this to justify immense changes), but we are also called to live in light of our remaining years. Changes are, you won’t die at 25, or even 30. And so you need to plan for the next 60 years. You’re in life for the long haul. We have people for a reason. Self-care or Recklessness? Often those around us have opinions, and weighing them up and taking them into account is important. God created us for community. How can we expect to impact people’s lives if we won’t let them impact us? I’m not ignoring the fact that sometimes God calls us to do crazy things, but I am saying that, more often than not, He calls us to do perfectly respectable looking things. If we can’t find anyone else who understands our point of view, perhaps we’ve got something wrong. It’s easy to twist a verse or two of Scripture to suit our needs, but if we take the Biblical Story as a whole, we see it contains stories of quiet lives as well as immense sacrifice. Our lives must be lived in beat with the Bible, and most importantly, with the Jesus revealed there. Q 3. Why don’t we talk about sacrificing our personal health? There are many sacrifices we don’t talk about in Christian circles, and I suspect this is because they are personal, rather than embarrassing. No one can tell you to sacrifice your health – it’s between you and Jesus. It is refreshing to find another person who shares and can talk about your own particular brand of sacrifice, but often these people are few and far between. I think perhaps there’s a general belief that young people deserve to be healthy. We know of course, this is not always reality. For this reason you may find you sympathise more with older people who have realised the elusive blessing of health, than with those your age. Either way, the body of Christ is called to share, and maybe God is calling you to sensitively share your insight with your peers. I believe we are called to make other people’s sacrifices easier by talking about deep issues, and sharing our own troubles. That said, we are not called to wait until something is easy before we sacrifice. It is hard to be alone in your sacrifice, so we must pray that God will both send people into our lives and be enough for us. Q4. What does the Bible say about all this? Are you looking for an explicit Bible verse or an explicit story? You might not find one. That’s not always how the Bible works. You will, however, find a Jesus who came into this world and suffered. Who sacrificed many things, often invisibly, which culminated in sacrificing his life. You will find a God who carried His people for years and years, only to have them spit in His face. You will find people who gave everything, and it wasn’t enough. You will find grand sacrifices (ie. Stephen’s Martyrdom) which are not written as grand sacrifices ought to be, because they were simply a sign of a bigger Sacrifice, one from God, not man. You will find men who gave everything, yet still wrote about mundane things like, ‘drink wine for your stomach Timothy’ or, ‘someone remember to bring my cloak next time you visit (I’m cold)’. 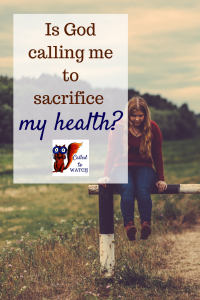 So, is God calling you to sacrifice your health? Sometimes sacrifices seem like sacrifices, other times they do not. Our sacrifices must align with God’s plan for our lives, which is not the same as his plan for anyone else’s. We are called to talk about our lives, and to share. We are not called to dictate to others what their choices must be unless it blatantly contradicts the Bible. The sacrifice of personal health is a valid sacrifice, but when, how and why is between the person and Jesus. The Bible shows us lives which embrace both big sacrifices and little ones, both recklessness and self-care, and so we know neither extreme has the monopoly on godliness. //Has God ever called you to sacrifice your health? Or has He called you to protect it? Which is easier? Previous Previous post: Can I be a missionary if my family member is sick?